Blago Bloggo's PDB Watch: 2016 Olympics Must Go To Rio de Janeiro! 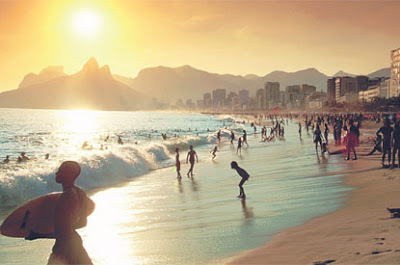 2016 Olympics Must Go To Rio de Janeiro! Just Say "No" to Chicago! Do it for the beaches. Do it for the weather. Do it for the babes! Don't make me do it! Don't make me pull out the big guns! These ammo-pounders are going to make you surrender like a whimpering monkey baby. I warn you. I'm warning you! I'm warning you! Really! I'm! Warning! You! You can't say I didn't warn you. You asked for it. Brazilian super-models follow, including Giselle Bundchen, aka Mrs. Tom Brady. Smitty was right! It has to be Rio! You may have won this round Penelope Pitstop but I will get you yet! Nancy Napoleonosi: Bad Blue Dogs! No Biscuit! Is this Cass Sunstein rumor true? America, can you smell what Barack is cooking? Wear that Badge of Honor with Pride, Joe! Oleg Atbashian is my Progressive-bashing hero! I could not sleep, then I found the cure!